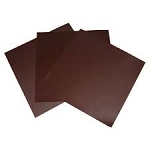 Colored Vinyl Magnetic Craft Sheets 8.5" x 11"
This product is 1 foot increments that are quick-cut off a roll of 20 mil Plain Magnet that is 24.375" wide'. 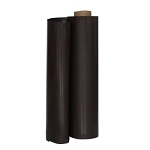 The rolls have no adhesive or printable surface, just plain black on both sides. Only one side is magnetic. If you order a quantity of 1, you will receive a piece of magnet that is approximately 12" x 24.375". If you order a quantity of 5, you will receive a piece of magnet that is approximately 60" x 24.375", etc. Remember, these are quick-cuts off the roll and will NOT be perfect. We sell only 100% American Made products at Magnet Valley so you know you are receiving a high quality product! Your shipping choices and pricing are shown to you after you enter your shipping information but before you enter any payment information. Accepted Payment Methods: MasterCard, Visa, American Express, Discover as well as Paypal and Checkout by Amazon. You are also given the option of mailing in a check or money order but be advised your order will not ship out until we receive your payment and it has cleared. Purchase orders are not accepted. Magnet Valley provides a secure checkout that is verified daily by Thawte. When you arrive at the payment page you will see the ‘https://’ in your address bar verifying the secure checkout. Most orders ship out within 2 to 4 business days. Copyright Magnet Valley. All Rights Reserved. Web Store Creator by 3DCart. Magnet Valley, 21923 State Route 676 Marietta, Ohio 45750. All site content property of www.magnetvalley.com. All products +/- 2 mil. All dimensions are approximate.